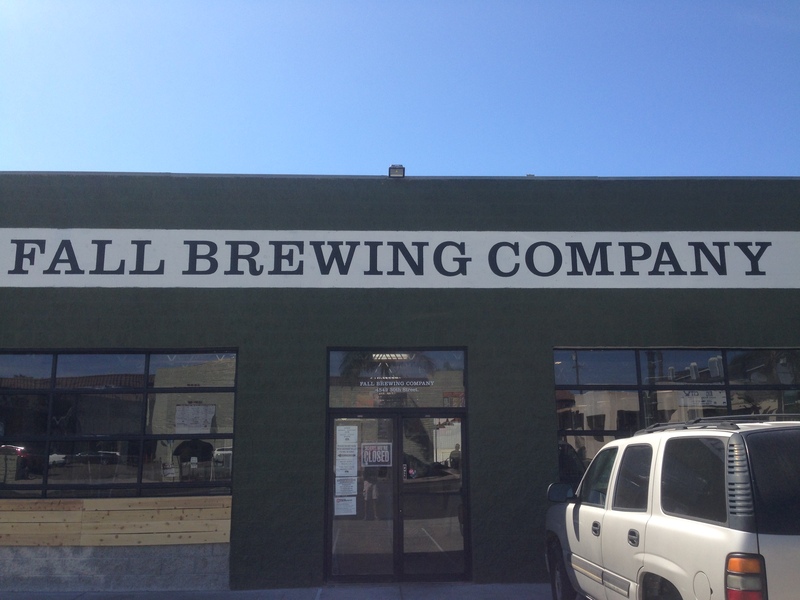 I first experienced Fall Brewing Company’s beer at Barrel Republic, a self-serve beer bar in San Diego, during a Valentine’s Day chocolate and beer pairing. The beer that I had there was the 2 a.m. bike ride, a sessionable coffee stout, which ended up making for the best pairing out of over a dozen beers that I tried. It was only a matter of time until I traveled the 10 minutes or so from my apartment to check out their brewery in North Park, a trendy, up-and-coming neighborhood in San Diego which is increasingly pumping out great beer, great food, and great places to serve it. The brewery has a sort of throwback, industrial feel with a minimalist touch, coupled with some warm, welcoming accents, such as wall planters, while other walls are plastered with old concert advertisements in black and white. The brewhouse is located just adjacent to the tasting room – all of which is an open space, with just a torso-high partition separating the two, creating a more intimate connection between patron and brewery. Taking a look at the tap list, I noticed that most of these beers are quite sessionable, which I commend for a brewery. 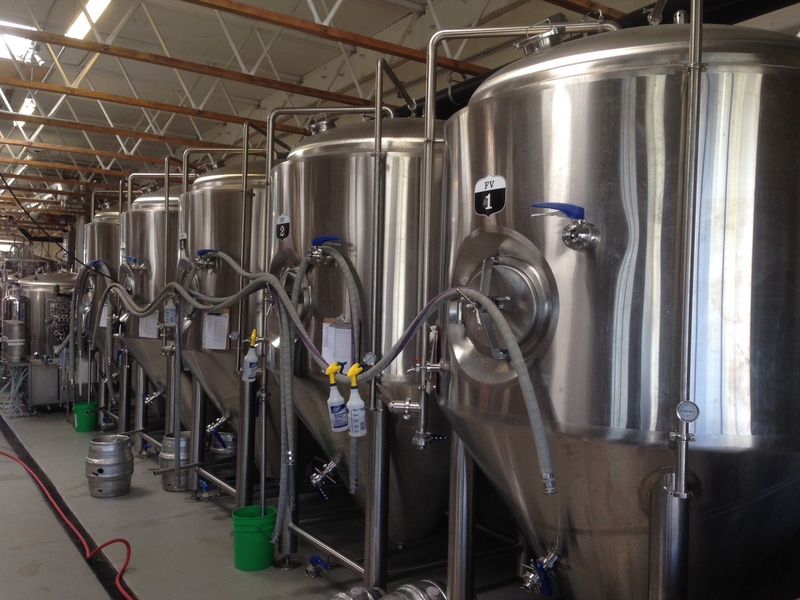 It is easy to go into creating the business model for a brewery with the “go big or go home” mentality. This is the west coast, and, more and more, people by the droves just want big IPAs, imperial stouts, barrel-aged this, sour that. Now, don’t get me wrong, I love all of these types of beers. I am even guilty of the tendency toward the more extreme beer styles myself. And of course, plenty of breweries have their more sessionable beers but also have their line of bigger beers. 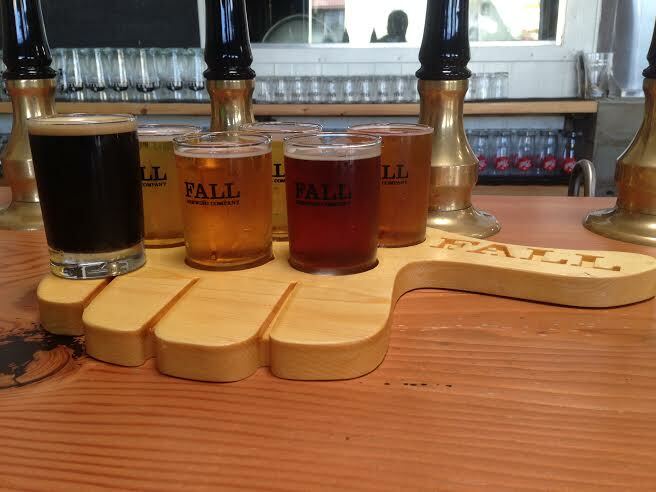 Breweries like Fall, however, are great in that they don’t even give you the option of going the extreme route. They force you to open your mind and explore the lesser-explored; these include more sessionable beer styles such as pilsners, sessionable stouts, English brown ales, steam beer. What’s a steam beer? Exactly. A steam beer is a lager that is fermented at temperatures that are more in the range of those at which ales are fermented. This is known as a hybrid beer, and typically results in a crisp, clean flavor profile with a light fruit character and pronounced bitterness. Anchor Steam is the benchmark for this style and has been brewed since 1896. Well, according to the chalkboard that contains the tap list at the brewery, the Plenty For All Pilsner is brewed in this style. They had me fooled, because this tasted like a straight up, authentic German Pils. Either way, it was delicious, with a nice, dry, bitter flavor profile that allowed the spicy, floral hop flavor to shine through without any impediment from darker, specialty malts. Next up was the Rise Above Czech Pils. This one had a little more malt sweetness and slightly more pronounced hop flavor, which is characteristic of the style. The hop profile of this one was similar to the Plenty For All, just a bit more in your face with a little more malt to balance it out. One of the first beers that I noticed on the tap list was the Green Hat IPA, Fall’s take on a West Coast IPA. This, unfortunately, was not available, which figures on a Sunday after a busy weekend (I will just have to make a return visit). The spirit of ‘77 IPA, a throwback to the beginning of the modern craft beer revolution, would have to suffice (I was planning on trying this one anyway). This one is brewed with the “three Cs,” Cascade, Centennial, and Chinook hops. Nowadays, there are over a dozen established hops that begin with the letter C, but these were some of the originals, and were pivotal in starting a movement that would change beer as we know it forever. When I took in the aroma of this beer, the first word that came to mind was “Chico.” Being one of the leaders and pioneers in the craft movement decades ago, Sierra Nevada Brewing Co. of Chico, CA is synonymous with the word “hops,” and the Spirit of ’77 IPA reeks of their beers. That piney, citrusy, hop flavor shines through in this one, with a solid malt presence to balance, but nothing too overwhelming – just enough to let the hops float to the forefront of the sip from start to finish, showcasing that beautiful west coast hop profile through and through. Next up was the Loudspeaker IPA, Fall’s Imperial Session Rye IPA. I don’t know why it can’t just be a rye IPA. Don’t the “imperial” and “session” cancel each other out? It’s 6.2% alcohol. Same as the Lagunitas IPA. But I digress. The hops and malts blend so nicely in the Loudspeaker, with a good dose of malt sweetness along with a wave of dank bitterness and spice, thanks to the addition of rye and liberal amounts of Crystal, Northern Brewer, and Cascade hops. I liken the flavor of this beer to if someone made a hoppy berry jam. A little blackberry flavor, maybe a little raspberry. It’s that combination of the pronounced malt sweetness mixed with the resinous hop bitterness that just comes together so well. Think hop candy. Had to throw a sixth one in there, of course. Speaking of hoppy berry jam (Please do not discredit me for using this term; it is the best way I can describe this flavor to the broadest audience), the next beer I tried, Unicorn Stampede, was even higher on the radar for this flavor descriptor. This beer is a hoppy red ale, with a healthy hop dose along with a pronounced malt presence. The latter lends a substantial sweetness to the beer, which, combined with the defined and assertive hop character, creates that hoppy berry flavor (there I go again). But a great sip, this one was. Now onto the one that I was really looking forward to. The one that I had already gotten acquainted with: the 2 a.m. Bike Ride. The name evokes visions of a wobbly, aimless, and desperate journey, but I believe that it simply has to do with the fact that this beer has coffee in it, 2 am is in the morning, and coffee is for the morning. Whatever the thinking, this beer has a bold coffee flavor, a creamy mouthfeel, and a great roast character to balance while leaving out the harsher component of roast – bitterness. Brewed with vanilla beans and locally-roasted Dark Horse Coffee, this beer is super approachable, seeming to appeal to a pretty broad audience. Judging by the consensus among brewery patrons, this beer was a favorite. And why not; it’s sessionable; it has a lovely coffee flavor while not being overwhelming; it has a creamy mouthfeel and flavor that is highly approachable among a broad audience. It’s sort of like a really early morning coffee, if you want to look at it in relation to the name. I was lucky enough to happen upon some free doughnuts from Nomad Donuts just a few doors down. I had my options, and chose a couple with flavors that I have a big affinity for: bacon and cardamom. The first doughnut I tried was Nomad’s bacon doughnut, which evoked memories of my experience with Rogue’s Voodoo Doughnut Maple Bacon Ale. 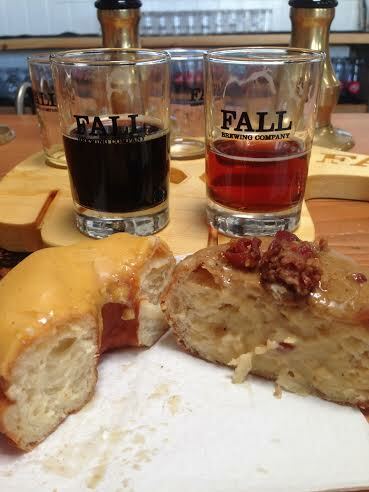 The doughnut did not taste like the beer that emulates a famous doughnut from Portland, Oregon, though. It actually tasted like french toast. It had some sort of cream filling, which was delicious, but the bacon did not come through a whole lot. It was delicious nonetheless, and actually reminded me a bit of a cannoli, with that sweet ricotta cheese flavor which I suspect the filling was made of. 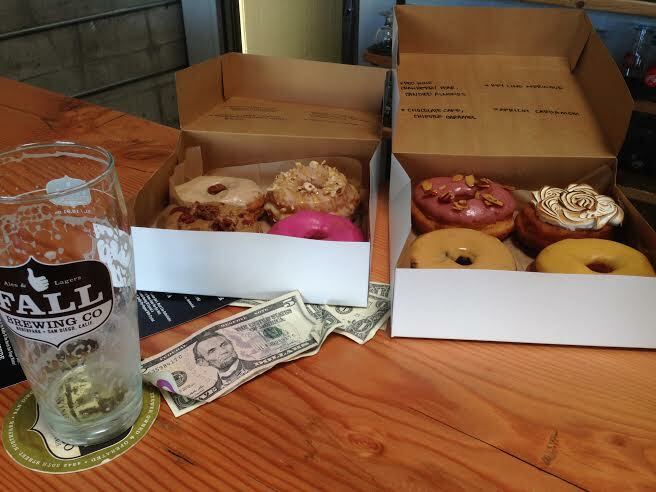 Naturally, I hung on to the last couple beers – the unicorn stampede and the 2 a.m. Bike Ride – for a little impromptu doughnut and beer pairing. The Unicorn Stampede Hoppy Red Ale with the bacon doughnut proved to be a very sub-par pairing. The doughnut really dries the beer out and takes the hop flavor away. All that remains is the bitterness, which is not to be confused with hop flavor. The hop flavor that I describe is bright, citrusy, juicy, tropical fruit. The bitterness is bitterness. Not really a flavor, but more of a sensation. Not to geek out too much, but this has to do with when the hops are added during the brewing process. Added earlier in the boil, the hops will impart more bitterness and less flavor or aroma because it will essentially be cooked off and the longer the hops boil, the more bitterness they impart onto the beer. Later hop additions in the boil impart more flavor, and once you get towards the very end of the boil, you get more aroma. Bacon and cardamom make for some killer doughnuts. We cannot forget about the apricot cardamom doughnut. Lots of cardamom flavor going on here. 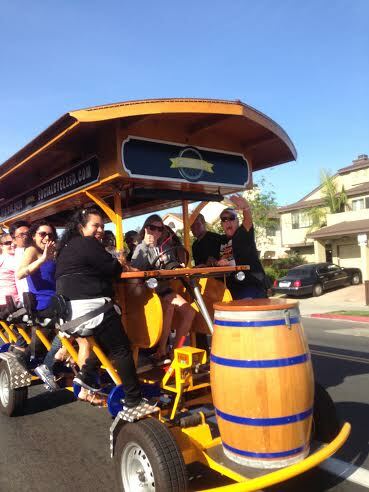 No telling how it will play with the beers in question. Well, it wasn’t great with either. Better with the Unicorn Stampede but nothing special. So, an opportunity for further research. Donuts and beer! #TheSimpsons #DuffBeer #Springfield.